So this is what I ended up with....for Free!! Now this little guy looks pretty good in the pictures, but I did give him some TLC. It is amazing what people will do in their own repair work. Some of these drawers were hot glued back together! I did a few nailing and wood gluing to make things better. I also sanded it pretty good, because there was a lot of...I don't know what...sticky stuff on it. Then I went to get some paint, from my garage. I wanted some type of blue, but I only had a small amount. So I got some white paint and an old perler bead bucket and started mixing. A little blue goes a long way! Then I painted the dresser. I wanted to try something different since it was going in my little 3 year old's room, so I busted out some vinyl and cut letters to use as a stencil, and painted some numbers on each drawer. I didn't have the money to replace the knobs, so they just got painted too. 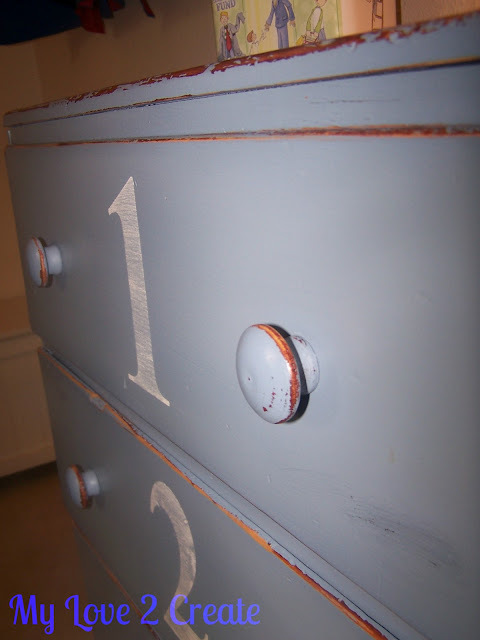 Then I distressed it on the edges and the numbers..... Voila! 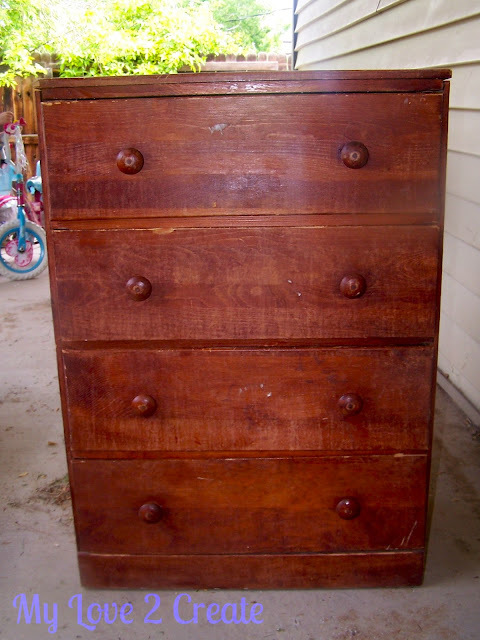 A "new" dresser for free! 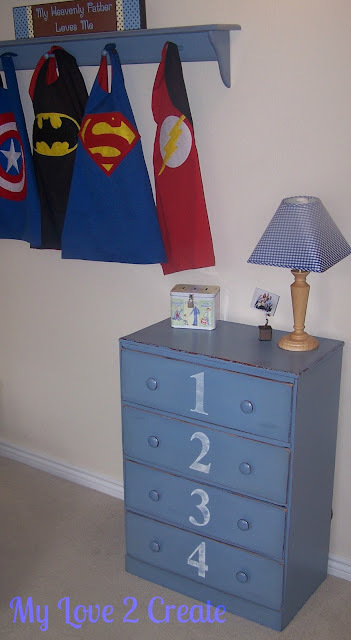 I am so happy with how it turned out and, yes...I get a little grin on my face when I walk into my little boy's room! Look what I did! Gotta love that "I accomplished something" feeling! Looks great and you can't beat FREE! Beautiful job - love working with numbers ( and you nailed it )and your distressing is just perfect! Thanks so much Suzan, you made my day! I am on my way over now! Super cute! 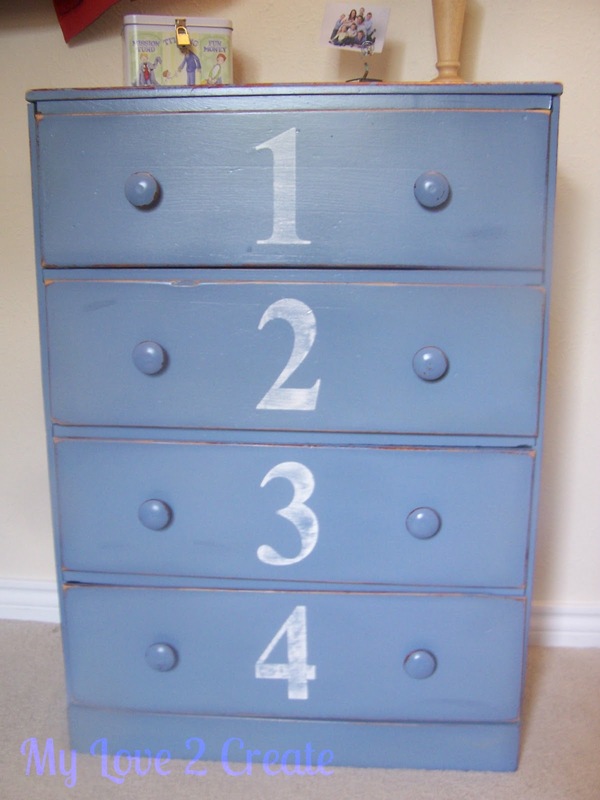 I always love a numbered dresser. I'm featuring yours at the Power of Paint Spotlight this weekend. How exciting! Thank you so much!!! Your capes are darling. The dresser turned out fabulous too! Thanks for stopping by my blog. 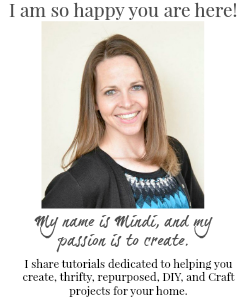 WOW Mindi. . . 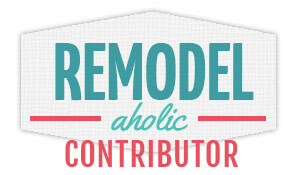 I just paroozed (Have no idea how to spell that) your entire blog and am amazed. Amazed. Amazed. Amazed. And comment above. . . I totally agree. The capes are darling too. Something I need for my little brood. Any pattern suggestions on that one? It would be super easy to do!